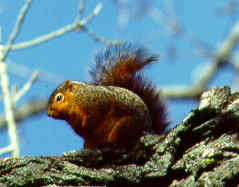 Only one species of tree squirrel makes a living on the Great Plains, and that is the Fox Squirrel. It is named for its rufous-colored fur. Its range covers the eastern half of the United States except New England. Introduced populations also exist in California, Oregon, Washington, Idaho, and Montana. In the eastern, more forested parts of the Great Plains, you may also find its cousin the Gray Squirrel, Sciurus carolinensis. Gray Squirrels are smaller and have white bellies, while Fox Squirrels have reddish-orange bellies. Fox Squirrels seem to be more comfortable with habitat where the trees are farther apart, and so are better adapted for the prairie. Squirrels are members of the highly successful rodent family, which includes members ranging in size from tiny mice to the South American Capybara, which is as big as a large dog. All squirrels like nuts such as walnuts, acorns, and pecans. When nuts are available, squirrels will busily harvest as many as they can and hide them by burying them in the ground. Later, when they are hungry, they will return and dig them up for a meal. They locate the nuts with their sense of smell. Many of the nuts are not found and this is a very significant source of new trees. After picking the spot, a hole is quickly dug with the front paws and the nut is poked into it. Then, with a motion that would remind you of someone working the shell game at a carnival, it will deftly cover up its prize. They are very good at this. Watch a squirrel bury a nut some time and then try to find it afterward! Nuts are not always available, however, so squirrels will take a variety of other vegetative food such as buds, flowers, and young leaves. Squirrels are also fond of the seeds found in the fruit of Osage Orange trees. Sometimes carnivorous, they will eat insects on occasion and rob eggs from bird nests as well! Fox Squirrels weigh around 3 pounds. Their length from nose to tail is about 10 inches and the tail is about equally long. Colorwise, they all look the same on the Great Plains, but in other parts of its range, the Fox Squirrel has some distinct variations. A dark-headed and grey-backed version lives in the southeastern part of its range. A silvery-gray version may be found in the eastern part of its range. Just as in other species, individuals are born occasionally with unusual colors. They may be much darker, much lighter or even albinos. In northeast Kansas, the town of Marysville is famous for a local population of black squirrels. Other towns have a predominance of black or white squirrels and take great pride in them. Look for information about these towns here. Squirrels make a limited range of sounds. The most common is the raspy barking they make when alarmed. Often this will happen when they are surprised by a person coming into their territory. This is accompanied by a lot of tail-swishing and quick sprints up, down and around whatever tree they happen to be in. Sometimes they will be so upset that they will ease down the side of the tree, barking all the while, to make sure their adversary knows just exactly how little the squirrel thinks of them. If this happens to you, try mimicking their barks back at them. If you can do a good squirrel bark, you will see the rodent equivalent of a "double-take". You will really hear some bad rodent grammar then! February is an important time for squirrels. That is when they begin raising their first brood of young. Breeding occurs in January, with much chasing around in the treetops as males try to woo the females. The female will prepare a nest of dry leaves, typically in a hollow tree. From one to six (average three) pups are born naked and blind. They do not venture out of the nest until they are two months old and accompany their mother for another three months after that. The siblings are often seen wrestling, playing follow the leader and doing other typical kid stuff. Yearling females will usually have only one litter per year. Older females will have two litters, with the second being born in early summer. Squirrels typically live 4 - 7 years in the wild. Squirrels also make leaf nests for loafing during the day and as "summer homes". They make these by nipping off small branches during the growing season and weaving them together around a sturdy forked branch somewhere in the upper part of a tree. It may be near the trunk or out on the periphery of the canopy. These can be easily spotted during winter after the foliage drops off the trees. 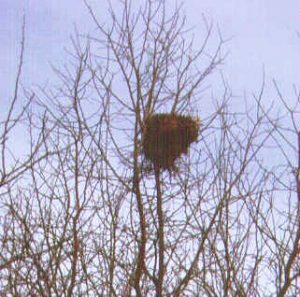 They can be distinguished from large bird nests such as those of crows or hawks because the bird nests will be made of sticks alone rather than leafy branches. People are divided in their opinions of squirrels. Some folks enjoy watching the antics of squirrels as they go about their daily activities. Others take a dim view of "tree rats", and go through elaborate (and usually unsuccessful) measures to keep them out of their bird feeders. Squirrels, however, are very intelligent animals and will outwit just about any obstruction placed between them and food. Squirrels are a common game animal throughout their range. Many hunters relish the challenge of bagging these quick and elusive animals. The culinary rewards are great. A brace of squirrels makes for a savory supper. Whether you see them as amazing arboreal acrobats, tasty entrees for the dinner table or thievin' varmints that hog all the sunflower seeds from your bird feeder, you have to admit that Fox Squirrels are very talented and interesting members of the Great Plains fauna.